The Uffizi Gallery director, Eike Schmidt, required the framework Dormitio Virginis, attributed to Jacopo Avanzi for the exhibition \"The Tricolur flag of protection.\"
The work, usually exposed at the Diocesan Museum of Assisi will be in Florence from December 19 2016 al 14 February 2017. The exhibition \"The Tricolour flag of protection\" is an opportunity to give attention to works that usually are not under the spotlight. The initiative aims also to make the commitment of the Italian armed forces in the protection of cultural and artistic heritage known. The story of the Dormitio Virginis. The framework, until 1944, was kept at the villa of the collector and art critic Frederik Mason Perkins, in Lastra a Signa, near Florence. He was taken away by the Nazis and discovered many years later by the Italian carabinieri. The painting was at auction in London. 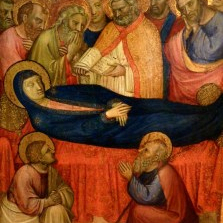 Instead it was brought back to Italy and included in the collections of the Diocesan Museum of Assisi, where there are other works of the American critic collection.